I need to logout for a bit but I'm wondering about the Valero backers. Who are their international heads and respective countries, including fields of study? Is that in the archives or should I search tomorrow (later if I can)? Also, who are the litigators for Valero? Every major oil company has an international team of lawyers, each versed in various international law, the highest paying being the litigators. In reviewing some things on the case today, I noticed that some questioned whether the address was faked on Robyn's (Elle Gardner) Model Mayhem profile. Looks like an accident and Robyn was ticketed for failure to yield. Confirms an address in Ashburn, Va. Offense Date : 05/20/2010 Arrest Date : Complainant : GARIS, R. L.
ORANGE CITY - The American Gary Giordano, who are stuck because of the disappearance of his companion Robyn Gardner, appears again tomorrow morning before the magistrate. The Public Prosecutor (OM) will again ask for an extension of his arrest, as late Advocate General Taco Stein know. This is the last time an extension can be requested and will hold up to 30 days. In that period, it is a summons up, says Stein. 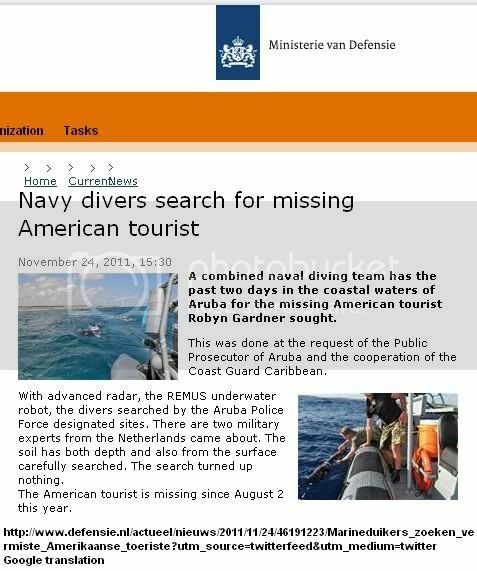 Meanwhile, the last two days by a diving team from the Royal Navy in the Caribbean in collaboration with the Coast Guard with the REMUS underwater robot searches for the missing tourist. That search yielded nothing on. 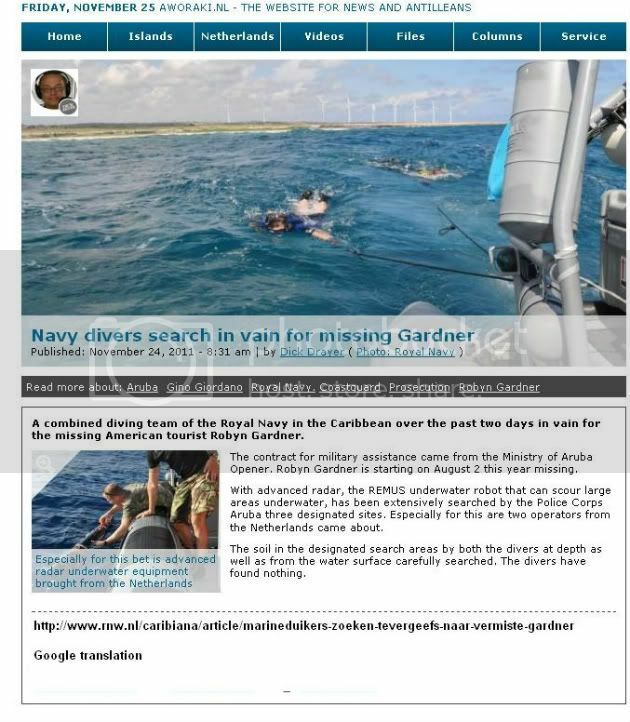 The prosecution had asked for assistance because certain parts of the ocean too deep for ordinary divers, said Stein. scirbi for lorna, november 24, 2011 esta one angry i have hanja in my curpa, have two aruban perdi on sea y after of three day owing to stop of buscanan, esta tristo. everybody of afor have pit on aruban, why! learn love thing is of we, all part of world one nation looking at for his hendenan at aruba only not!! That sounds like they may have checked some of the areas of interest on land too with the radar? I think they may have set Gary Giordano free. 25 of november 2011 10:29 diabierna morning after of owing to atende cu the caso of gary giordano that is being sospecha of one as or another as of the desaparicion of the lady tourist robyn gardner, the judge owing to arrive at the desicion of let the sospechoso termina cu the detencion his 30 dianan y entrante tuesday now place in freedom. after of owing to hear the desicion of judge gary owing to his wowonan owing to fill cu water y owing to cuminsa llora. in the declaracion cu the advocate mr. chris lejuez (cual will is here on in some minuut) will can hear algo more of the caso y can look at the fotonan y video relaciona cu the caso here. This says Tuesday night at 8, he will be released. diabierna morning huez owing to rechasa peticion of fiscal for prolonga detencion of gary giordano principal sospechoso in desaparicion of the tourist mericano robyn gardner. tuesday 29 of november for 8'or of night the will recobra his freedom. An Aruban judge declined prosecutors’ request to hold a Maryland man in jail another 30 days, his lawyers told NBC News. Gary Giordano, who is suspected in the presumed death of his travel companion, Robyn Gardner, of Frederick, Md., could walk free Tuesday. Aruban Solicitor General Taco Stein plans to appeal, but if that appeal doesn’t happen before Tuesday, Giordano will be released and can board a plane back to the United States, News4’s Jane Watrel reported. Stein doesn’t know when the appeal date will be set. In Aruba, charges can be filed only once. Stein said prosecutors need more time before filing. Prosecutors do intend to charge Giordano eventually, Stein said. At that point, Giordano can be extradited back to Aruba, Watrel reported. 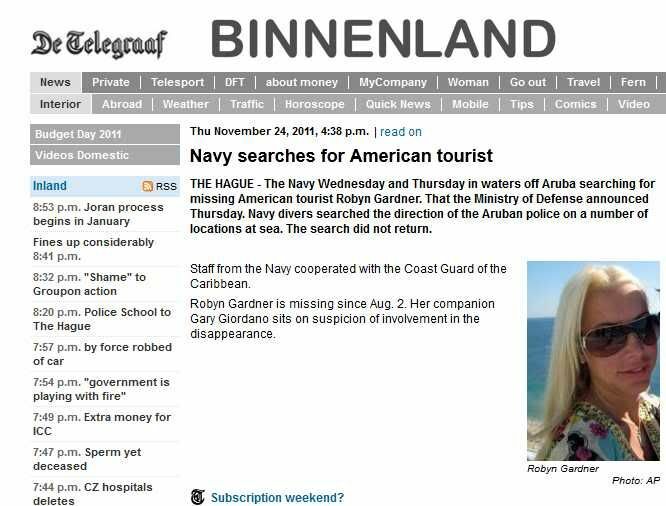 Gary Giordano, the main suspect in the disappearance of Robyn Gardner in Aruba several months ago, will been released from an Aruban jail early next week, ABC News reports. ABC News confirms that an Aruban judge on Friday threw out a request from the prosecution to keep Giordano detained without charges for another 30 days. His detention was last extended by 30 days on Oct. 28. Prosecutors admitted in that hearing that they had no body, no murder weapon and no solid motive, but that they had felt over the past few months they had gathered enough circumstantial evidence to keep Giordano detained. Texasmom, my article is a duplicate of yours. Sorry! Comstock/Thinkstock(ORANJESTAD, Aruba) -- Gary Giordano will be released from an Aruban jail Tuesday and be home by Wednesday, according to his attorneys. Giordano, who is the only suspect in the Aug. 2 disappearance of Robyn Gardner, has been detained in a Aruban jail for over 100 days without being charged as prosecutors scramble to recover evidence linking him to Gardner's suspected death. A judge denied prosecutors' latest request Friday to keep Giordano locked up for an additional 30 days despite the absence of a body and murder weapon. He still faces a possible Maryland grand jury indictment in connection with the case. During Friday's hearing, Giordano made what his lawyer Jose Baez described as a "heartfelt plea" in an effort to explain his story. A judge on Friday morning decided there was not sufficient evidence to keep the suspect in the disappearance of American tourist Robyn Gardner in custody. Gary Giordano is scheduled to recover his freedom on Tuesday, November 29 at 8 p.m. Page created in 2.138 seconds with 20 queries.